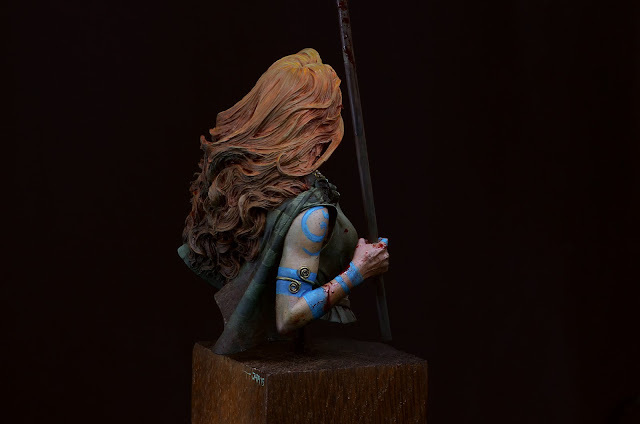 today finally Boudica's Step by Step will see the light of day. She waited long enough we'd say. During last Tuesday's Tutorial voting it was easy to see that she would win. Thanks to everyone who voted and decided. Without further blabla we'll get it on now. Roman is taking over with the article in a sec and we hope you enjoy! Allright. 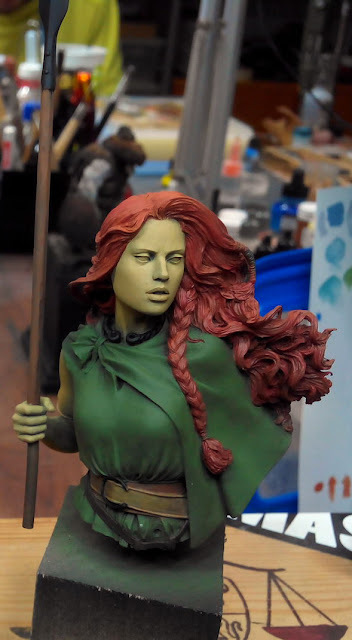 Well this article is a step by step through the process and progress I have made painting this beautiful sculpt by spanish sculpting god Pedro Fernandez Ramos. 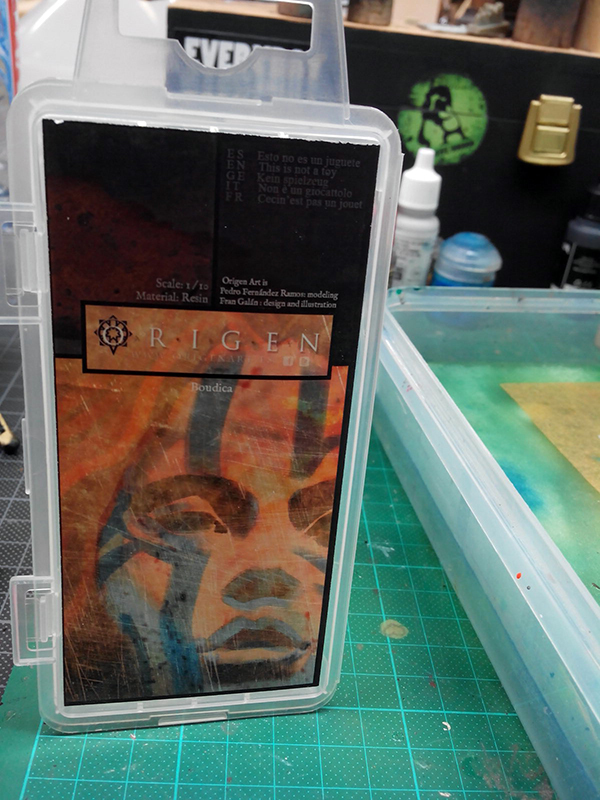 The model itself was distributed via Origen Art. 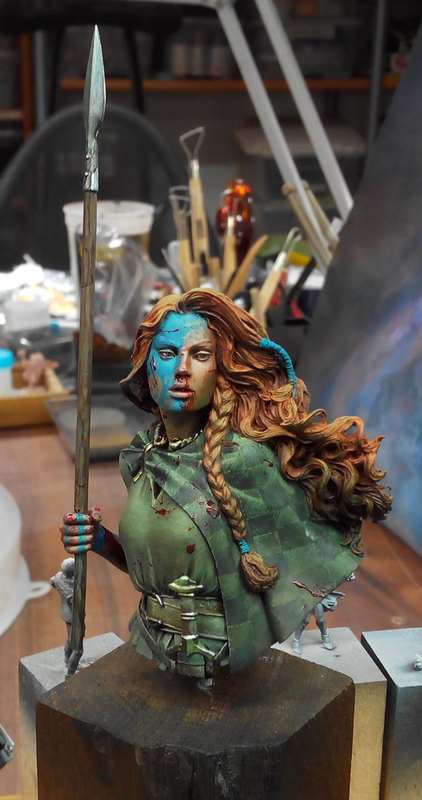 A small spanish company, with very cool unique models, but sadly the company closed in the end of 2015. 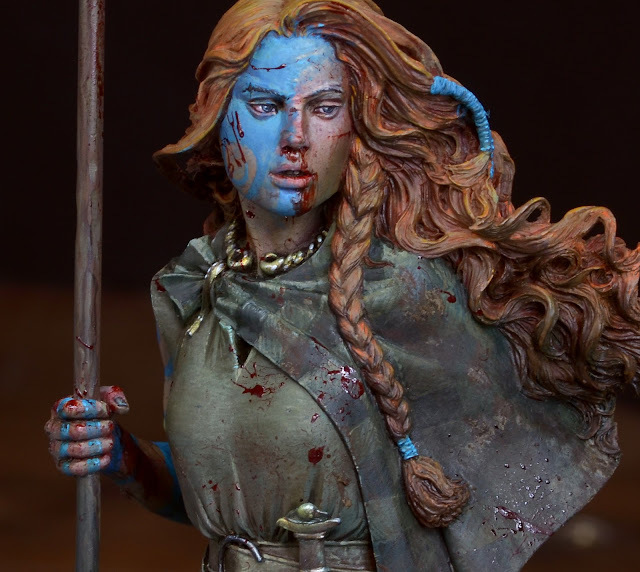 Rumors say that Boudicca will be available from somewhere else in the future. Good news actually. The bust itself is truely beautiful. Not only the women sculpted is magnificant in her beauty, it is also the expression of the whole body language on this piece. Majestic, powerful and sad were my interpretations. So I decided to put her in her historical context and did read several novels, articles and stuff on her. I decided to put her in the middle of the Battle of Watling Street, where her army was defeated, just in that right moment. If you want to read more about the history lesson on her, please follow this link. I have to somehow excuse for the difference in photo quality in this step by step. Some shots were made with my digital camera, some were made with my mobile's and some were made with Raffa's really good big camera. 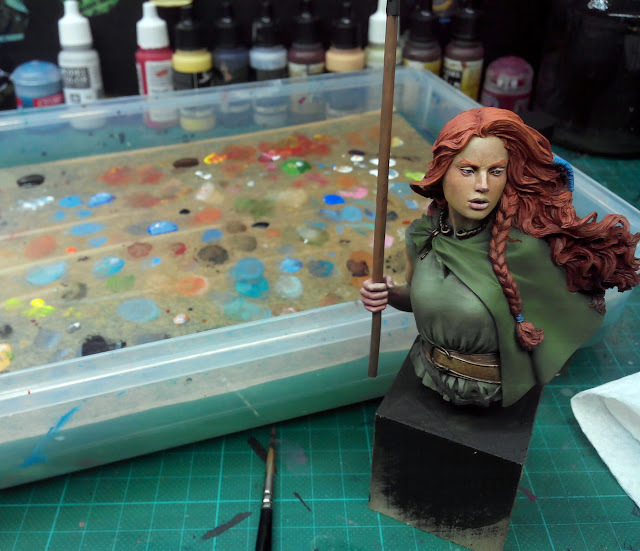 If you prepare articles on your own too you might know how hard it is to keep track if you are in the middle of the painting process. Following I will take you on a journey through painting her up the way I did. I let you know my thoughts, my steps and my ideas. If you like what you can read here and/or if you have the feeling this can provide help to your own painting please consider a small thank you in form of a jungle donation. For a coffee, a beer or a candy. Always remember, these articles take much time to be prepared and written. 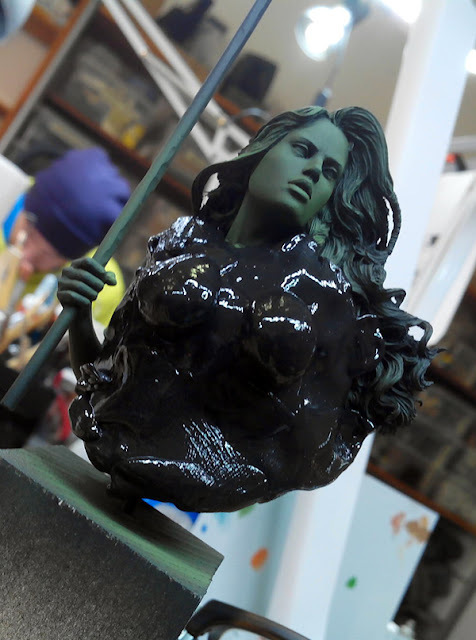 I used a Vallejo's green primer to prime the whole bust with my airbrush. Why green you might ask? Well, for me green was the main athmospheric color I saw in my vision of her. Fighting on a non-cloudy day on a green plain of grassland. With this first step I already set my athmosphere and would stick to it. For example doing a rather warm athmosphere on a miniature you can already prime it in warm tones, same for cold tones. I do not exactly remember the exact primer name. It was green and I know there are many, but honestly it works with all kind of greens to set the athmosphere. Do not stick yourself too much to color names if you want to learn about painting with colors. 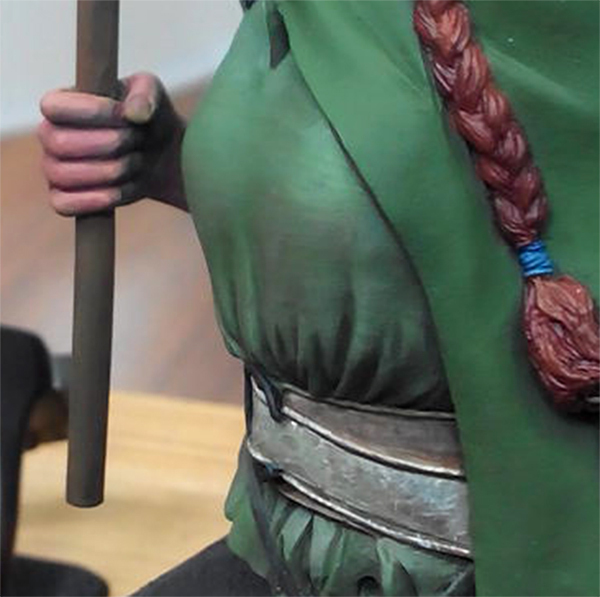 After the green was set I used Masking Putty to cover all clothing. I knew I would keep the clothing green after all. I explained using different masking options via the article: Masking Options. Next step was using the airbrush on top of this again. This time I decided for a basic skin color and used Vallejo, as I remember right it was Brown Sand, added a little more yellow to it to have it more yellowish, added a little more red to have it a little more orange, added a little bit of white to the mix to have it brighter, added a tiny drop of blue to it to make it less saturated and finally added a small drop of green to it to stay in my overall athmospheric color. 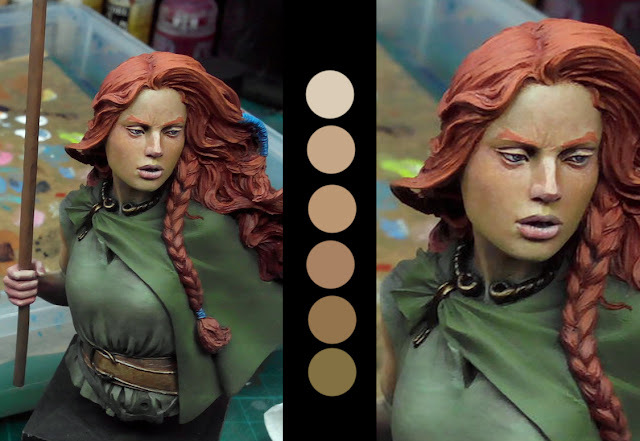 I mixed this from several tones on my wetpalette and applied it via the airbrush in thin, fine layers. About 5 to have all skin areas covered. 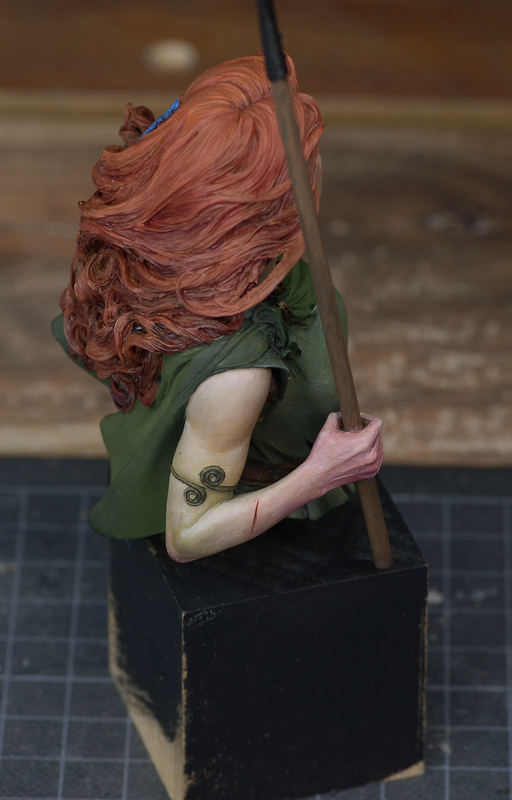 I painted the basic colors to the hair and the wood and leather parts. 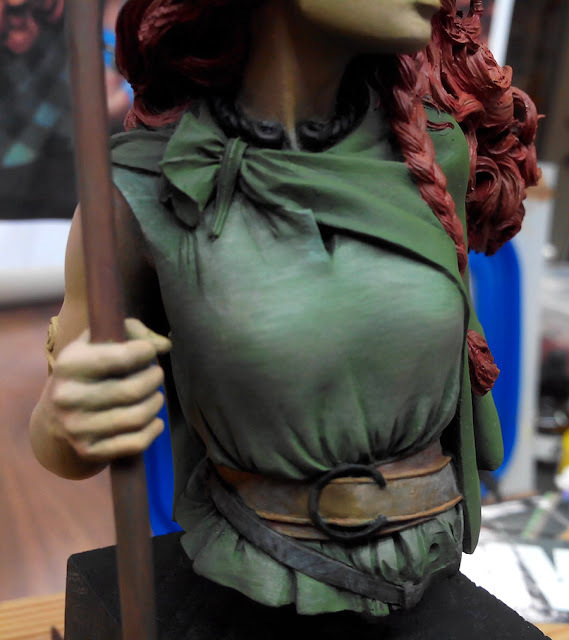 You can already see a small change in shadows in light on the hair or spear shaft. I did this while painting the basic colors, just added a tiny drop of black to the areas while painting them up. Black to metal parts. 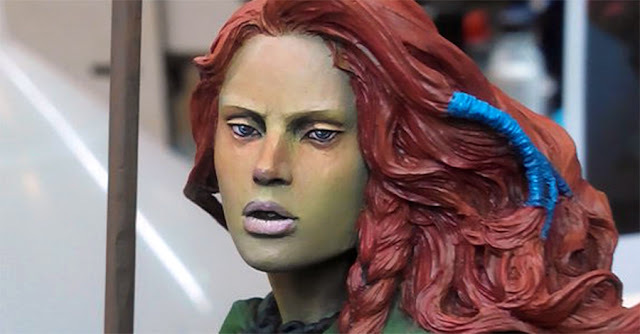 I really love Pepa Saavedra's beautiful version of this bust and as you can see on the next photo I made my homework: I prepared prints on my workbench for inspiration. 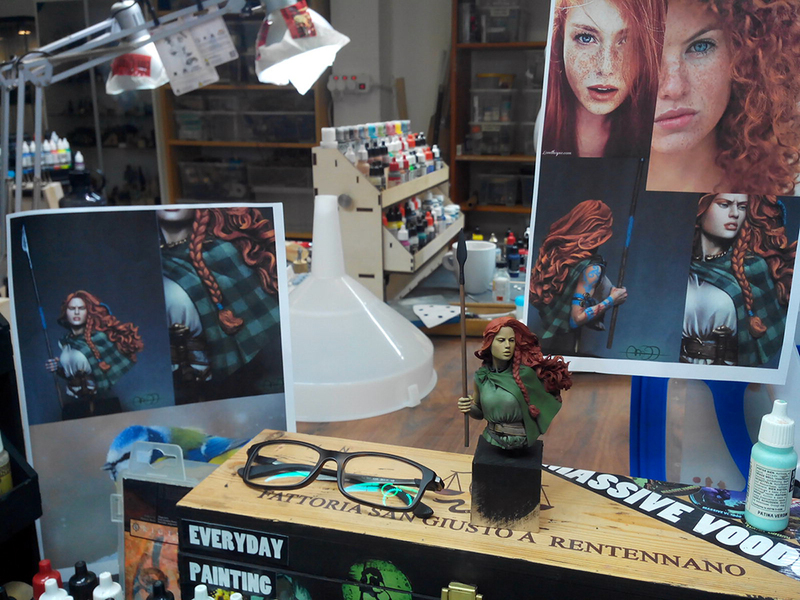 Pepa's work, some inspirational red-haired woman. I do not like to waste my brain in the early beginnings of a paintjob to thoughts that do not fit in this stage of the progress. I do not think about how to create a beautiful blending now. I want to paint. So I took a more brighter green, that I mixed from a yellow and blue, more blueish to keep it cold, added a little red to it to make it less saturated and added white to have it brighter. I used this color as a glaze now and used one of my brushes I usually use for painting thin lines (good tip, good color flow!). Then I began to paint thin vertical lines to the clothing. In several layers, the glaze was not too thin, I was already able to see the first lines, then I painted more on top on areas that I would be hit by zenithal light. 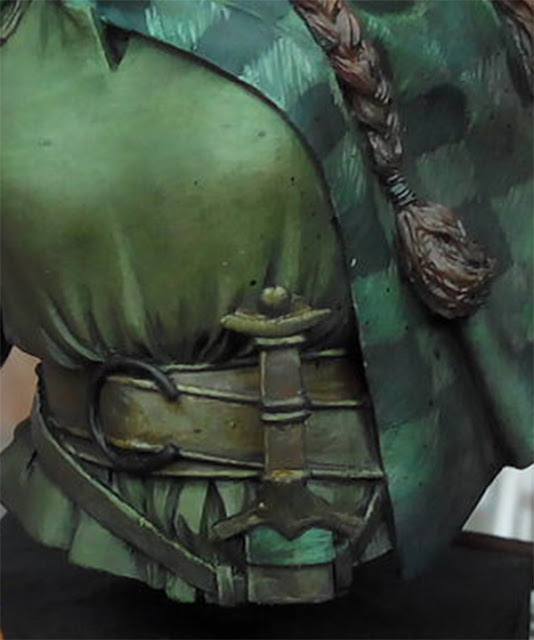 I used the same color as a glaze to place some texture to the leather parts. Just a simple prep, nothing finished yet. I used a skintone again, still the one that I mixed, but this time with less green in it and started to bring back the forehead area, nose, cheekbones. I left the greenish area on her lower face. Used red and orange thin glazes to paint her middle face area. 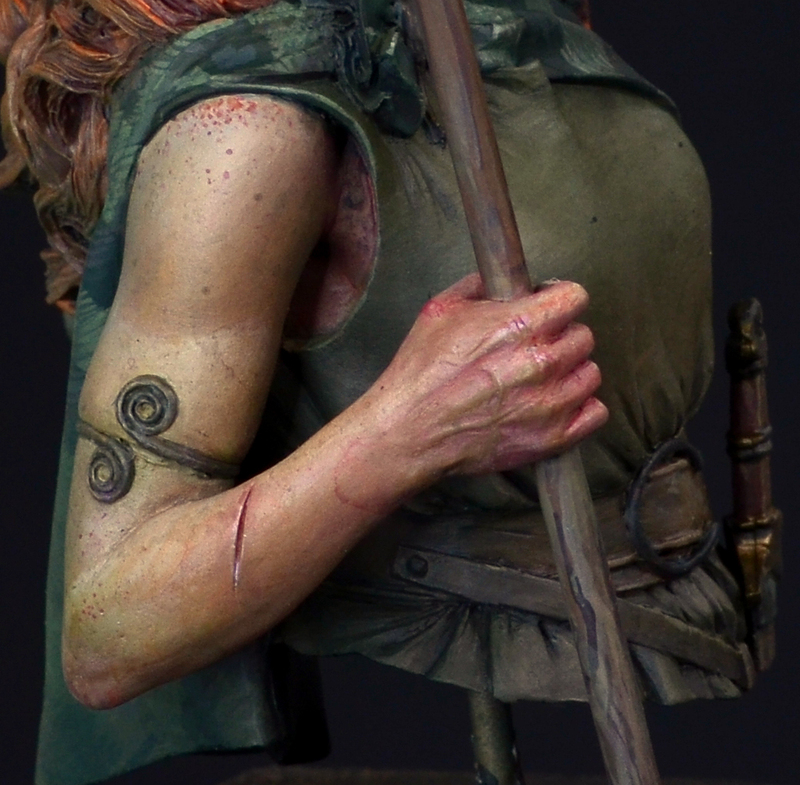 Her fist holding the spear was packed with several red glazes. If you use glazes thin you have to appyl them more often. I used some of my basic mixed skintone, added more red, more white to it to paint to her lips with an even brighter line to demonstrate the light situation. Still all is sketching. I also increased the texture on the leather belts with more stibbling brighter tones there, painting a line here and there or intensing a crack that the work so far made visibile. I painted her eyes. 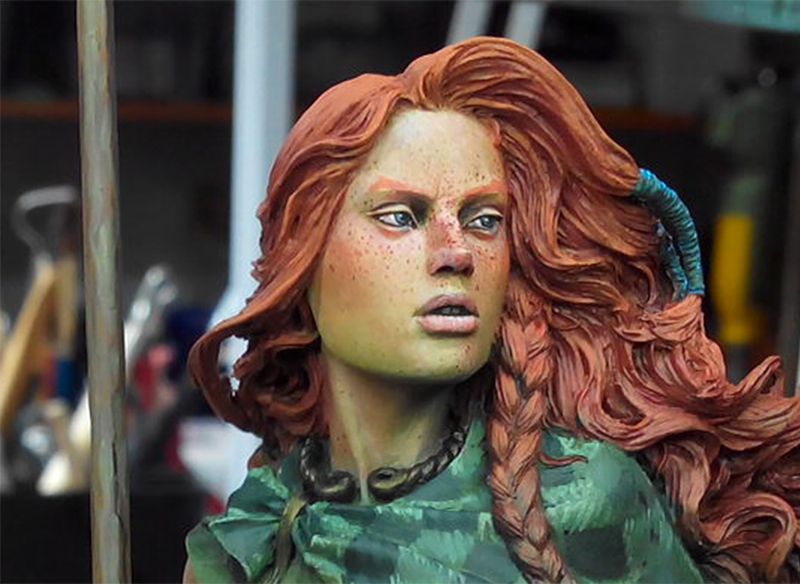 They were painted at this stage to see the character rather quick. Ok, it was time to bring some more colors and a sketch of the light situation to her hair. 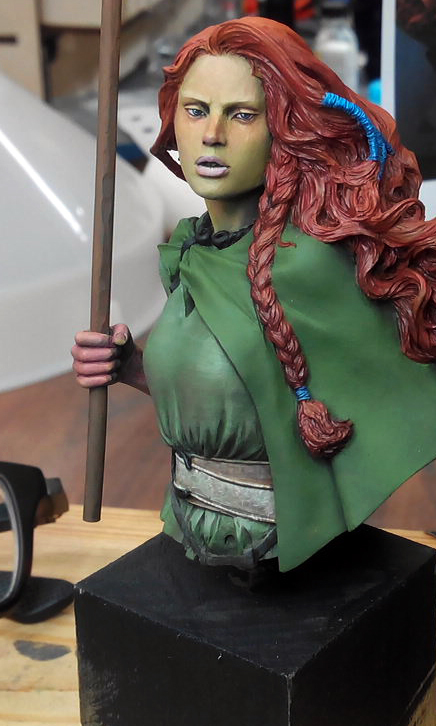 The hair is sculpted amazingly good, but I already knew it will be a pain in the head to paint it up. I went with some more orange in my red to set first highlight areas. I say "areas" because I did not start with small highlight lines or such. I covered surfaces, prepared large areas for further work. I also painted her eyebrows. I recommend to do this rather early as eyebrows are very important to a human painting. Without they look strange, very strange. 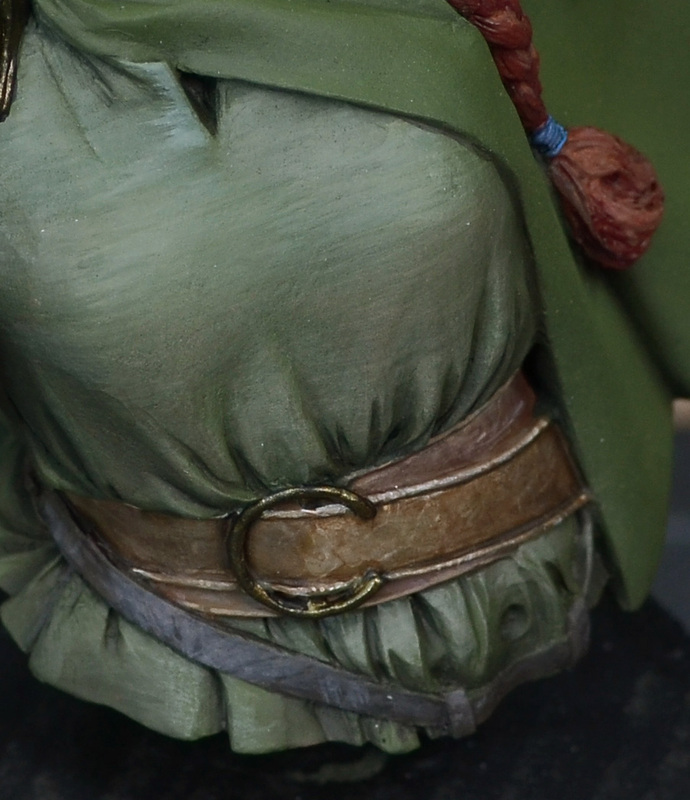 I also did put a wash of Army Painter's Soft Tone on top of my leather textures to pull them together. I increased the light situation on her skin. I did not paint a lot into the shadows, as the big issue with female faces is: They are smooth. Male faces have hard shapes, females not. If you paint too strong shadows into a females face they will look dirty, weird, old and not real. My oppinion. So I painted more into the highlights and used different colors for different face areas. Also dropped some on her arm and fist. Painted a really dark undercoat for my bronze metal parts by using a mix from black and gold. Here you can see the skincolors used. If you look closer you can spot where each one was used. Not to forget the arm. 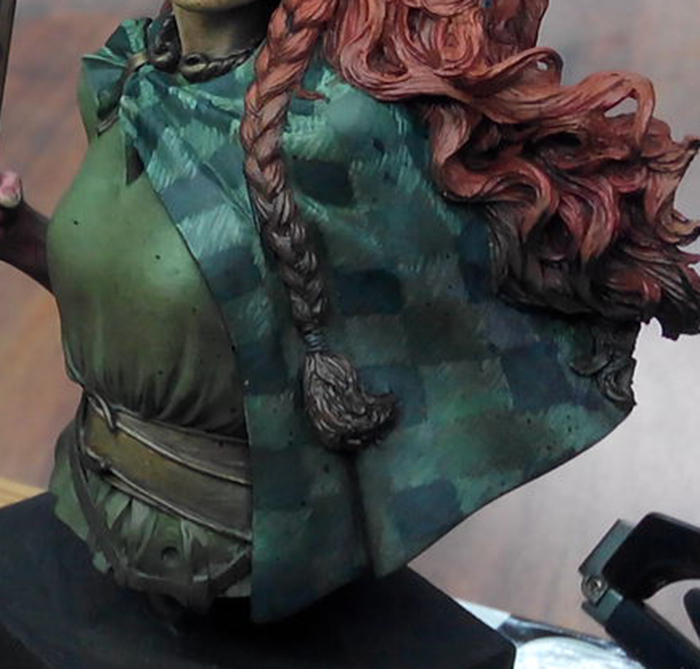 Something I had to do, but wasn't convinced of my skills was painting that tartan pattern. I can tell you I tried to avoid it for a long time, but then I just had to. I took inspiration from Pepa's work and decided to copy it, but copy it my way. Rough sketch first, details if needed later on. The hair recieved really dark areas too by using several applications of Army Painter's Strong tone. Oh how this hair made me already nuts. 2. 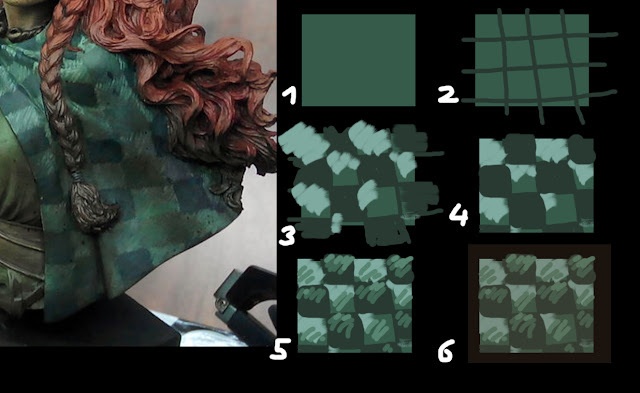 Using darker green to draw pattern. Take care of the drapery and think. I managed to be good in some areas, failed in some others in my eyes. In the end I increased the fabric texture once again with using the colors again for the lighter areas. I remember doing these steps several times to make it look like I wanted it to look. While I did step 6 some uncontrolled drops of the wash hit the clothing here and there. I did not care as I knew that I wanted to make her dirty in the end. I also painted up her sword grop and added it. Via Pinterest I found many red-haired woman and most of them were freckled. Ok I told myself. Let's freckle with reddish skintone dots and my brush. Loved this step. ... but thought it was too much so I went back to my skintones again and painted the freckles to look more natural instead of looking like red dots. I used glazes of my skintone varieties for this. Added a red glaze here and there to make the face look more alive. 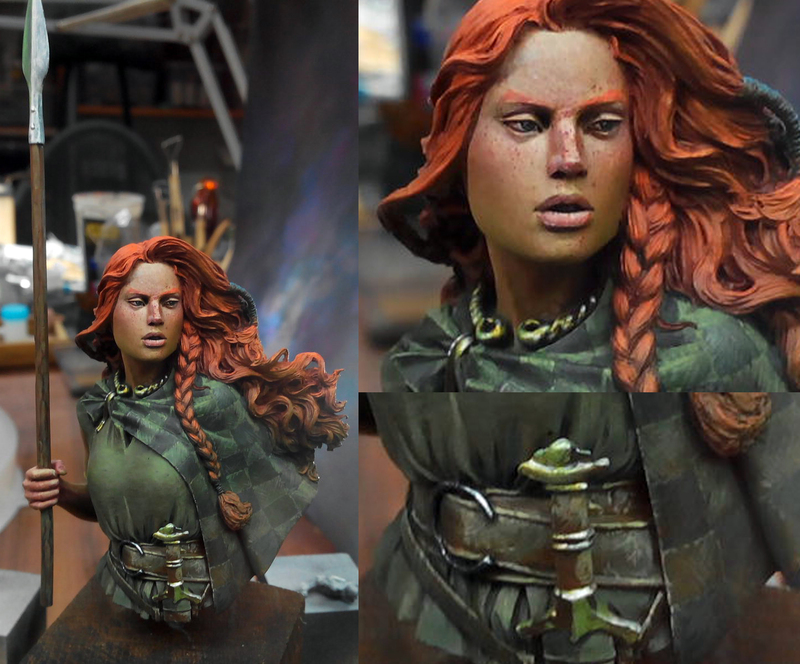 I reworked the leather areas again and repeated steps that I have done before. Bright again, darker with a wash or a glaze. Did work on the metal parts and added a light situation to the metals. Interesting for you might be that you can find my green athmospheric color in all of it. Worked the same on the arm. 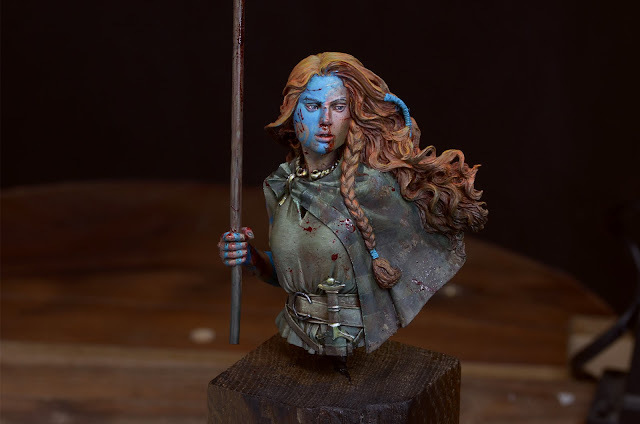 Well If I would have known how crazy I might go with the warpaint and blood I would have saved some time on the freckles, but I always say keep it real, which means: In real her warpaint would be on top of her freckled face, eh? 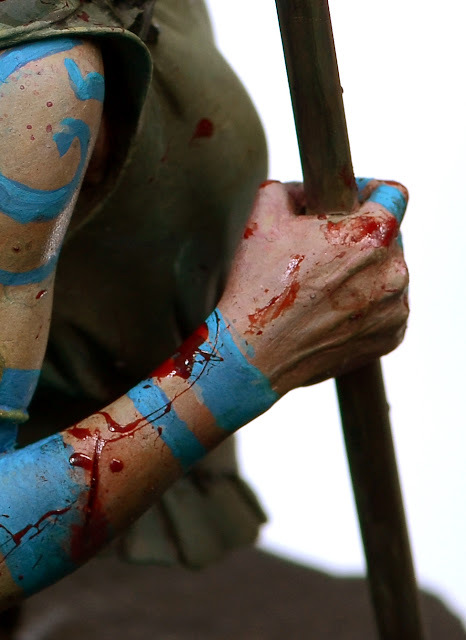 - Blue Warpaint. I decided to paint it like the real thing. Using strong blue and a bigger brush I put it where I wanted it. 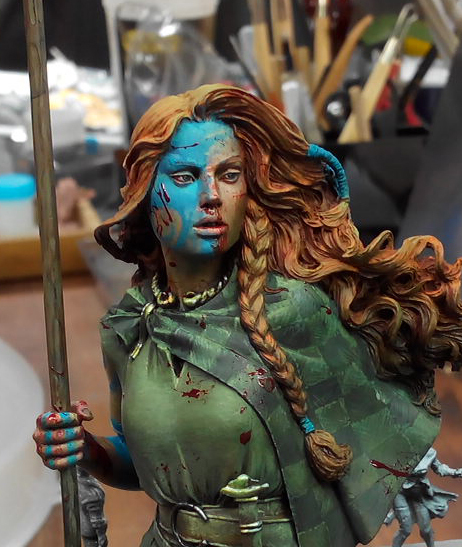 I used a brighter blue to show the difference in the light situation even in the warpaint. - Increased the light situation on the fabrics, both. With the use of brighter lines. For the blood I went carefully, even it does not look this way. I used masking putty again to save some areas from accidents that can happen.I used GW's Blood for the Blood God for this. She looked funny. Well, in the end I can remember I spent sometime to clean up here and there, making some highlight areas more intense and stand out, but this was only detail work here and there. Every minute spent is worth the time. Finished she looked like this - bloody and gory. The way my imagination was of her in that moment. I hope you liked the insight into my painting mind. 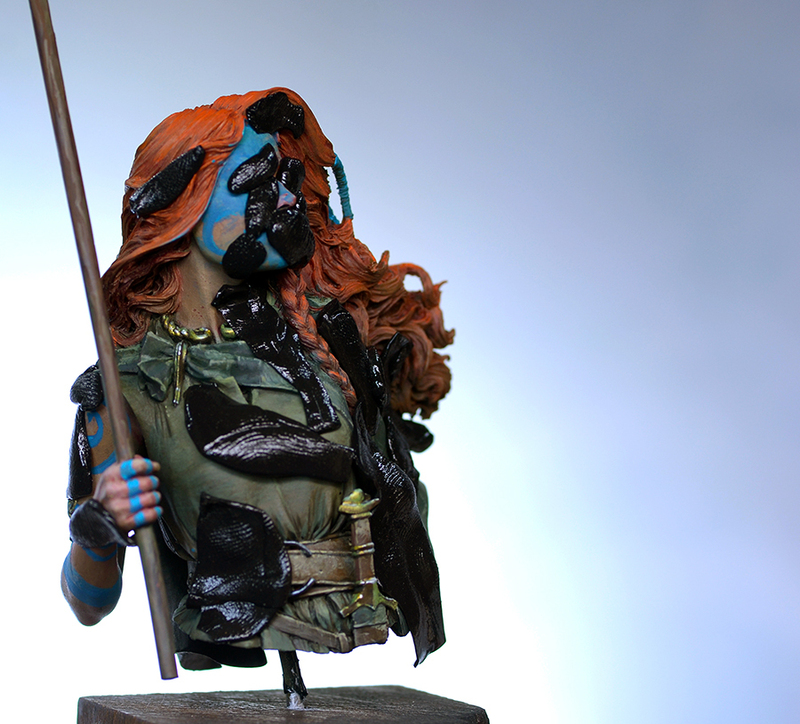 You can find more photos of her on Putty&Paint. She is also on Sale, if you are interested to make this paintjob of mine yours! 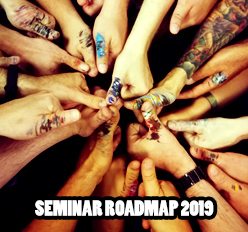 If you got any questions let me know. Of course feedback to the article is welcome. Excellent! It's grateful that you share in detail how your thinking develop every step of painting. Large images are also very useful to learn. Very inspiring, as always. Amazing step by step Roman! thanks! Wonderful tutorial! Thanks for all the insight into your process. Very nice. Well, actually very bloody and tough but still nice.